Ran one mile in 9:10. Walked and lifted weights afterwards. Isn't this all terribly exciting? How about a picture? 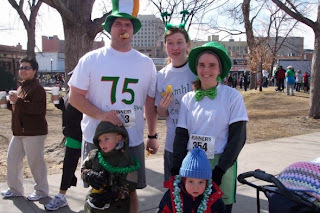 This one is from the 5-k we did on St. Patrick's day. The 75 on my shirt is the number of days I had run in a row at that point. My wifey made the shirt, isn't she kewl? Yes, very very very kewl.